Preheat the oven to 325 degrees and line a rimmed baking sheet (I use 2 corningware casserole dishes & it works just fine) with parchment paper. Use a piece of parchment that is longer than the baking sheet, so that the paper hangs over both short sides of the pan. In a large bowl, mix together the oats, walnuts, coconut, chia seeds, ground ginger, and cinnamon. Mix the water & salt in a small microwave safe bowl, microwave for 10 seconds, stir. Add the brown sugar, oil, and honey and stir until the brown sugar is melted. Microwave for another 10 seconds if needed. Using a spatula or a wooden spoon, stir the oil/sugar mixture into the oat mixture until it’s fully incorporated. Spread the granola onto the baking sheet in an even layer. Bake for about 40 minutes, stirring well every 10-15 minutes or so to prevent burning. Watch carefully until the granola reaches your preferred level of toastiness. 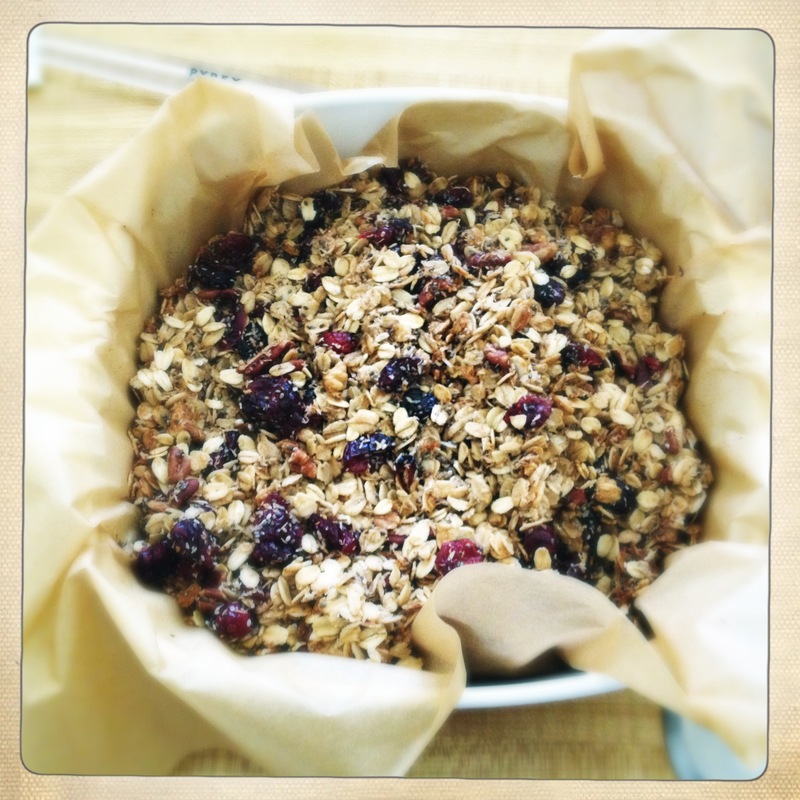 Remove from oven and, while the granola is still in the pan, stir in the chopped ginger and dried berries. Now set up a large cooling rack inside a separate baking sheet. Carefully transfer the granola onto the cooling rack, parchment and all, using the overhanging edges of the paper as handles. Spread out the granola as evenly as you can without spilling over the edges of the rack, and allow to cool for about 40 minutes. Store in an airtight container for several weeks, or keep it in the freezer to preserve its crunchiness.